"Is Thailand the Test Case?" Few Americans realize that England’s Queen Elizabeth II is not the world’s longest-reigning living monarch. As Culver S. Ladd informs readers, that achievement belongs to Bhumibol Adulyadej, who was crowned king of Thailand in 1946. The eighty-four-year-old royal has survived twenty coups, two wars, and numerous internal uprisings and challenges, and, after two-thirds of a century on the throne, remains a unifying and stabilizing force for his people. Ladd taught and worked in Thailand on and off for more than thirty years. He has drawn on his personal experiences to document the struggles of a nation and a people trying to build a modern, democratic, and economically viable state. Like many journeys, not all movement is forward. Ladd’s tale is rife with stories of corruption and coups, of internal unrest and foreign pressure, and of an elite tightly clutching their power and privilege while common folk fight to break ancient bonds of servitude. Ladd’s prose is not always easy to read. He switches back and forth between first-person remembrances and reprints of lectures and articles he gave and wrote for various organizations and publications. The thirteen chapters include no fewer than 138 subject headings, some presented as multi-page essays and others given a mere paragraph or two. This stratification is at times confusing, especially because the focus on minutiae often takes the reader down tangential paths that lead away from the big picture. Fortunately, Ladd does not linger too long on such byways, and by the next chapter usually brings the reader back to the main highway of his work. 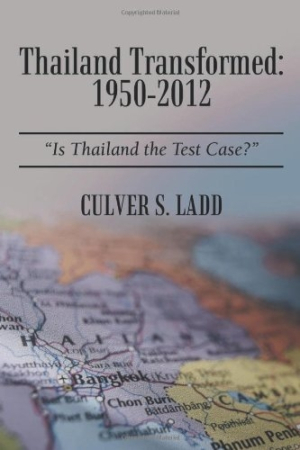 That Ladd has devoted his professional life to the study of Thailand is evident in the detail he puts into his history. Over 350 footnotes and more than a dozen charts and tables provide evidence of the research he compiled for the volume. However, it is his personal impressions of his time in Chiang Mai (which he dubs “the heartland of Thailand”) and the Sukhumvit section of Bangkok that give Thailand Transformed an authenticity that a pure academic study would lack. Ladd does not merely write about a nation in transformation; he writes about going through that process with the Thais, making his book essential reading for anyone who wants or needs to understand Thailand and its people.